Speculation as to whether Kylie Jenner is pregnant seems to have been ongoing forever, and it’s just heated up after photos of an underwear shoot emerged online. Kylie, along with sisters Kim, Khloe, Kourtney and Kendall, has posed for Calvin Klein’s Spring-Summer global campaign – and she’s covering her waist in every one. Of course, everybody was focusing on that instead of the actual campaign itself, as they did when she went off social media for a bit and wore baggy tops. 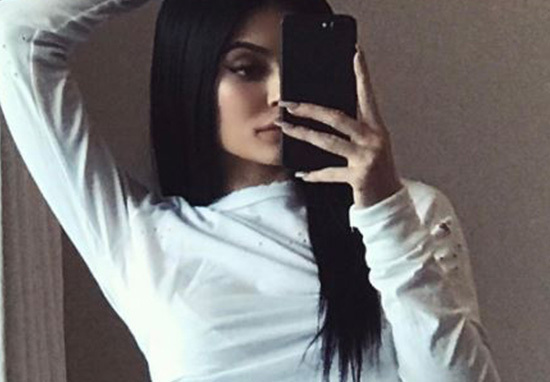 Kylie Jenner, who is rumoured to be expecting her first child with boyfriend Travis Scott, is seen concealing her supposed ‘bump’ underneath a red-and-white quilt, while her sisters lay on top of it. Khloe is also present in the photos and is without bump – despite being pregnant – which is because it was shot back in October. The girls’ mum, Kris posted one of the shots on Instagram along with the caption ‘proud mama’. There was speculation Kylie was surrogate for Kim and Kanye’s baby, Chicago West, who was born on January 15 – but that again, just rumours. Reasons as to why people think Kylie was Kim’s surrogate were pretty weird, including the fact Kim was posting pink imagery on Instagram. Ok. I totally think that Kylie is the surrogate to Kim’s baby. Kim is having a baby girl…everything Kylie was hinting to was the colour pink. Low key Kylie is the surrogate for Kim’s baby girl that’s why she would post things with pink on IG. So rumours say Kylie was in labour around the weekend, pink clues in baby shower pics, then Kim’s surrogate has their baby yesterday!!? Seriously? Kylie is the surrogate. It’s too coincidental. Kim confirmed the good news the surrogate had given birth last week to her daughter, weighing 7lbs 60z. So now people are talking about Kylie’s apparent pregnancy again. Kylie Jenner is the second sexiest sister and she’s covered with a blanket the whole Calvin Klein shoot, yup she’s pregnant. Kylie Jenner is the second sexiest sister and she’s covered with a blanket the whole Calvin Klein shoot, yup she’s pregnant. ?? The photoshoot was released alongside a video campaign in which the sisters play a game of ‘never have I ever’. She’s very happy about the pregnancy but she doesn’t want to share this with the world. Her not being out is strictly personal preference. She wants to keep this one aspect of her life private. I suppose Jenner has been on TV her entire life, and for a lot of women pregnancy can be incredibly conflicting and uncomfortable. Could it just be that she doesn’t want the memories logged on video for the rest of her life? Who knows, why does anybody care so much?